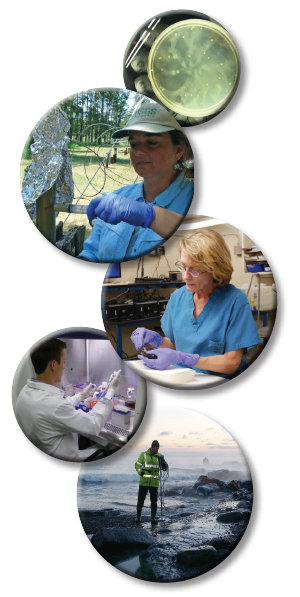 The GeoHEALTH–USGS Newsletter—published since 2006—provides information on new USGS science activities pertinent to safeguarding the health of fish, wildlife, domesticated animals, livestock, and people from environmental exposures to contaminants and pathogens. PRIVACY STATEMENT regarding Newsletter email signup formThis form is subject to the Privacy Act of 1974, as it relates to privacy policies of the U.S. Geological Survey (USGS), a bureau of the U.S. Department of the Interior (DOI). A full description of USGS privacy policies are available online. Purpose: The USGS purpose for collecting email information is to be added to a USGS GeoHealth Newsletter subscribers list manager. PII as defined by the Office of Management and Budget (OMB) may be minimally collected by USGS to accomplish a purpose required by statute, regulation or executive order. Disclosure is Voluntary: If the individual does not furnish the information requested, there will be no adverse consequences. However, failure to furnish information (email address) asked for on the USGS GeoHealth Newsletter sign up form may delay or cancel distribution of the newsletter.